What Exactly Is LED Strip Lighting? 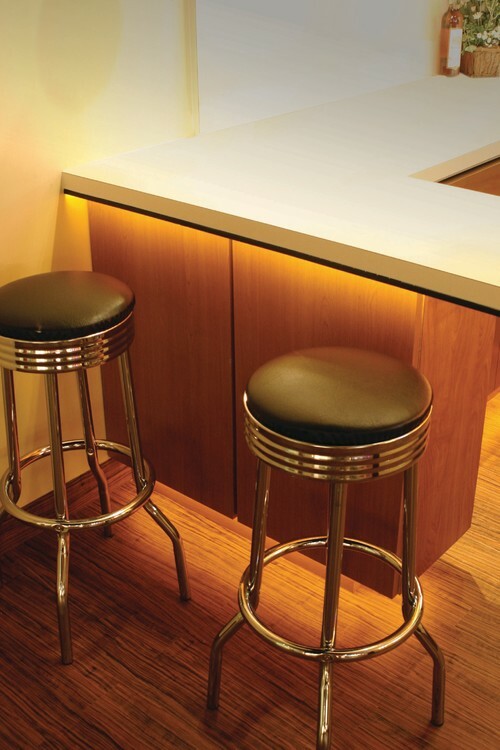 Popularly used in places like kitchen cabinets, wall soffits, and outdoor decks, LED strip lighting is extremely thin and energy efficient compared to traditional halogen or fluorescent under cabinet fixtures. But what is LED strip lighting, and how can you use it in your home? Let’s get started! In layman’s terms, LED strip lights are a line of LED bulbs placed on a piece of electrically wired tape. From up close, you can actually see the individual bulbs, however once the light is viewed from far away it creates the illusion of a single strip of continuous light. These super-thin “fixtures” come in standard and water resistant models, making them suitable for indoor and outdoor use. As we mentioned earlier, LED strip lighting is an easy but effective way to illuminate otherwise dark areas of your home. 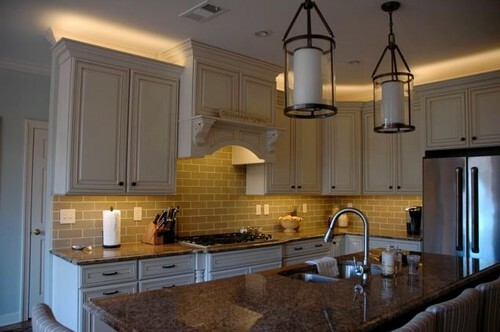 Take a look at how these crafty homeowners used WAC LED strip lighting to brighten their breakfast bar. Strip lights aren’t only used to illuminate dark cabinets; in fact, many homeowners choose to use them as accent pieces rather than for utility purposes. Just take a look at how the creative homeowners below used LED strips to brighten the space between their cabinet tops and the ceiling! Having trouble reaching for your favourite book and movie titles at night? 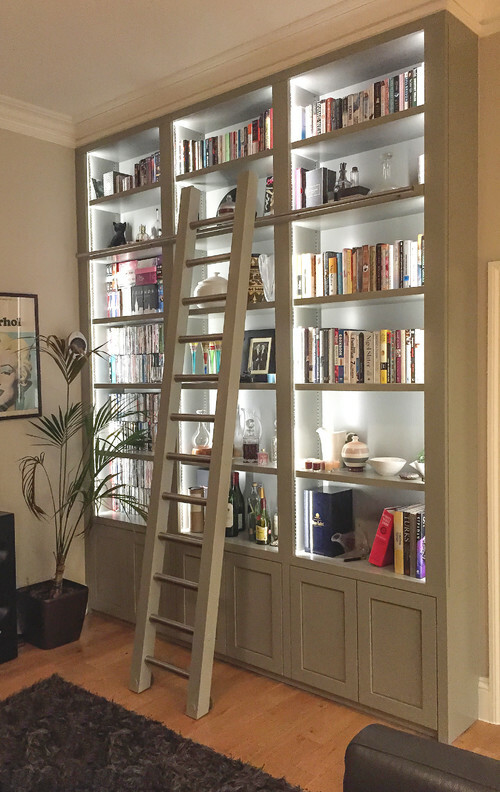 Create a custom backlight for your bookshelf by placing short strips of LED lighting right behind the bookcase shelves! This unique design won’t just make it easier to find what you need, it is guaranteed to be a conversation starter when guests come over as well. A project like this would take a professional just a few hours, making this noticeable upgrade not only beautiful but affordable as well. The outdoors is good for more than just day-time use. 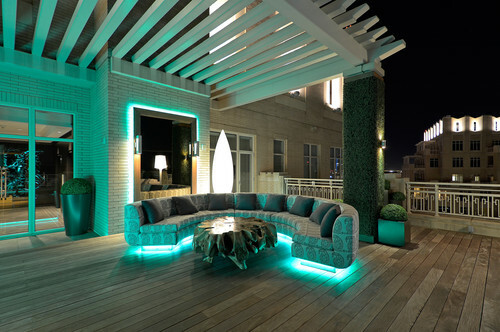 With LED strip lighting, you can turn your outdoor living space into a night time retreat. Just take a look at how the home below has used blue-tinted LED strip lighting to illuminate the high traffic areas of their deck without hanging a single fixture.